Stay organized and reduce clutter by using Calorsa Travel Storage Bags that help minimize storage space at home, work or in your luggage. 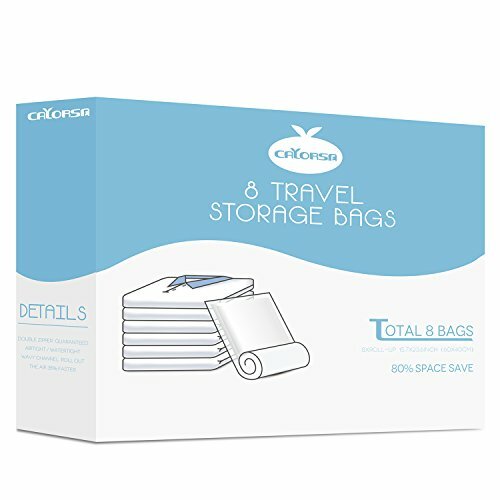 If you're looking to safe space in your travel bag, reduce the mess in your closet, or keep your kid's stuffed animals off the floor, there's no easier and more effective way than Calorsa Travel Storage Bags . Crafted with a high-density, tear and moisture-resistant plastic, our airtight, sealable storage bags help keep your blankets, clothes and personal items neatly organized by rolling the bag and squeezing oxygen out of the bag. Great for flattening items for storing them in closets, bags or the garage, you can finally keep your life organized with minimal effort. No vacuum or pump needed, that makes it easy to seal your bags at home or on the go if you're using them on vacation! Click "Add to Cart" now and get this 8-piece vacuum storage bag set to organize your home, office, kid's rooms or travel bags today. KEEP YOUR HOME ORGANIZED - Eliminate clutter in your closets, making travel bags smaller, or keep stuffed animals stored safely away with airtight compression bags. LONG-TERM STORAGE & PROTECTION - Vacuum-sealed storage bags help keep your clothes and personal items free of dust, moisture, moths, and bugs for true safety. EASY-TO-USE REUSABLE DESIGN - Tear and moisture-resistant, our vacuum bags can be used over and over throughout the year to save space in cars, homes, or suitcases. 8-PIECE VACUUM BAG SET - Every order comes complete with medium storage bags, perfect for your bedrooms, garage, or office organization. 100% SATISFACTION GUARANTEE - We want you to be completely happy with your order. If for any reason you are not satisfied, we will gladly accept your return and refund your money. If you have any questions about this product by CALORSA, contact us by completing and submitting the form below. If you are looking for a specif part number, please include it with your message.